a mode of operation of an electric drive in which a braking force is created by the interaction of a constant magnetic flux in an electric motor with the current of a closed electric conducting circuit. In an electric drive with a DC motor, dynamic braking is produced by short-circuiting the armature winding or by closing its circuit through added active resistance when the field winding is energized. In an electric drive with an asynchronous motor, dynamic braking is achieved by passing a direct current through the stator winding; in this case, the rotor winding forms a closed circuit. Dynamic braking of a synchronous electric motor occurs when the field winding is energized and the stator winding circuit is shorted or closed by means of added active resistance. Examples of the connection of DC and AC motors to produce dynamic braking are shown in Figure 1. The braking force depends on the frequency of rotation of the electric motor. This relationship is called the braking speed-torque characteristic of the electric drive. At different resistancesR1 < R2 < R3 < R4 the speed-torque characteristics vary in both DC motors (Figure 2, a) and asynchronous motors with phase-wound rotors (Figure 2, b). Losses of energy in an electric motor during dynamic braking have a value on the order of the kinetic energy stored in the rotating masses of the electric drive (at complete rest). Dynamic braking is used for fast stopping of the electric drive of machinery, when even raising and lowering of loads is necessary, and in mine hoists. Golovan, A. T. Osnovy elektroprivoda. Moscow-Leningrad, 1959. 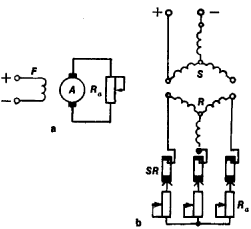 Veshenevskii, S. N. Kharakteristiki dvigatelei v elektroprivode, 5th ed. Moscow, 1967. Meistel’, A. M. Elektroprivody s poluprovodnikovym upravleniem: Dinamicheskoe tormozhenie privodov s asinkrhonnymi dvigateliami. Moscow-Leningrad, 1967.